Craft Fair Banner: Make it BOLD! It occurred to me the other day while getting ready to participate in the Ingenuity Fest, that I didn’t have a proper banner for my table. Okay, okay, so I guess it didn’t just occur to me. It’s actually been on my To Do list for a long while. You know how these things go. You get so caught up with making your products as sweet as you can, but the actual display gets pushed off until the eve of the event (or worse, the event itself!). But once at said event your stuck with what you brought. Usually, at least in my case, it takes an impending event to push things like banner making to the top of my To Do list. So yesterday morning, with just four hours before going to Ingenuity Fest, I asked Jon to help me create a proper banner for my table. I’m really lucky that he was able to help me out with this project. Jon has a really great eye for text layout and has had a lot of practice with it in recent months because he makes hand-drawn signs for his job at Trader Joe’s. He’s been really inspired by old Pink Panther cartoons lately, as you can tell in his use of font and star bursts circa the 1950s(?). This style also influenced the design of my banner. When coming up with the concept together, I knew that I definitely wanted something using a font that resembled a typewriter, since I actually use one in the creation of some of my work. Jon thought that something that also had a hand-drawn look would be appropriate, to which I totally agreed. To be honest, the black fabric base of my banner came to be because it was something solid that I had a lot of, but I’m glad I chose it. Originally, Jon had wanted the letters to be really colorful (with each letter of zween in a different color), but I thought something simpler would be better and more versatile. 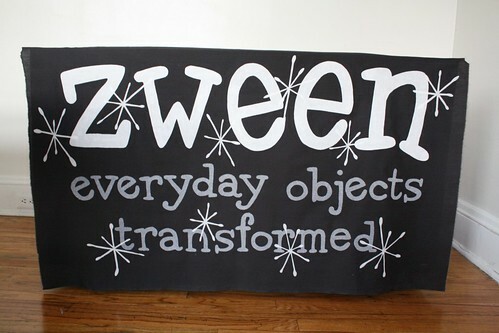 So then he suggested a plain white for the word zween, so as to make it stand out really well, and a medium gray for the secondary text “everyday objects transformed.” It was also his idea to incorporate the little star bursts to set off the words “zween” and “transformed.” The star bursts also give it a retro flair, which I really enjoy on a personal level, and because I use a good amount of vintage items in my display, I think it’s appropriate. Now that it’s finished and I see it next to the signs Jon created for Trader Joe’s, I feel like the black fabric makes it resemble a chalk board, which is also kind of cool. So, do you want the scoop on how we actually made this banner? This project actually ties in perfectly with Stashbusting September, because I used only materials that I had on hand. Maybe the same will be true for you, especially in the case of the fabrics, but if not, you can easily acquire the materials at your local craft store and fabric store. Base fabric- yardage will vary depending on how big you want your banner. Mine was 4 feet long and 45 inches wide. Secondary fabric- (any fabric you want to use for you lettering)- yardage will vary depending on how big you want your letters/designs and how many you have. Heat-n-Bond iron-on adhesive- This is a no-sew way to fuse two pieces of fabric together and is available at Pat Catan’s (sold in a 5 yard x 17 inch roll for around $11). *unfortunately we were in a bit of a rush to create my banner, so I did not take pictures of each step. If any part of the process is unclear to you, please write your questions in the comments below. Step One– Decide how big you want your banner to be. Since I do a number of smaller shows, I designed my banner around my 4 foot table, but I also plan on using this same banner for shows where I use my 6 foot table (or when an 8 foot table is provided). I also decided to take advantage of all of my vertical space (from the top of the table to the floor). Step 2– Using your large piece of paper that is the same dimensions as your banner, draw out what you want your banner to look like. If you are unsure of your design, I suggest making thumbnail versions first. We have a pad of jumbo sized newsprint from our art school days, but you could easily use news paper tapped together. Just use a contrasting marker to draw your design so that you can see it easily. Step 3– Cut out all your letters/ pictures. My design was very simple, but basically you will have to cut out shapes for each color that you are using. If you have letters that repeat (such as multiples of the letter “e” or “t”) you can just cut out one of each to save time. Step 4– Unroll your sheet of Heat-n-Bond paper side up and trace your letters in reverse (back words). (See image below). Step 5– Separating the letters by color, roughly cut them out leaving a small amount of Heat-n-Bond around each letter. You can leave your letters all jumbled together and connected for this part and in fact I recommend it, as it will save time. Step 6– With your letter fabric wrong side up, place the sheet of Heat-n-bond (now with your letters drawn on) on top so that the paper is up. Now you will iron the Heat-n-Bond to your fabric using the iron setting described on the package. Are you following me so far? 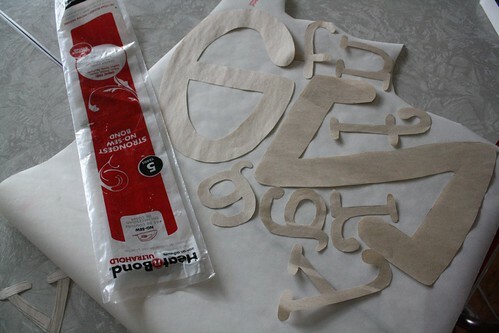 Step 7– Now you will carefully cut out each letter, following the tracing lines you made earlier. Step 8– Once you have all of your letters and designs cut out, lay your old blanket on the floor. This will be your ironing surface. I found it to be crucial to be able to lay out the design in it’s entirety before ironing. Spread your banner fabric (right side up) on your blanket. Remove the paper part of the Heat-n-bond from the backs of your letters and position them onto your banner. Step 9– After you have everything position exactly how you want it you can use your iron to set your letters/designs in place. And voila! You now have a totally awesome custom-made banner for your next craft show! I have a few upcoming craft shows and this is a great tutorial for making a banner that really pops! Thanks for this great post, I love your blog! I’m glad you found the tutorial helpful! I was a little worried that it would be confusing and hard to follow without pictures. I hope you post some pictures of your new banner on your facebook page once you get it done! Love your new banner! Very nice explanation of how to do! That’s great Sunchi! Congratulations on moving toward getting your work “out there.” It’s so important to see peoples reactions. I can be both invigorating and sobering. In my experience, the more public you are with crafting, the more fulfilling it becomes. we were on the same wavelength about banners, however I used silk, a natural choice for my products,and hand painted/dyed a banner. you may want to have a website listed on the banner but it looks great! Love your banner – yay for Jon. 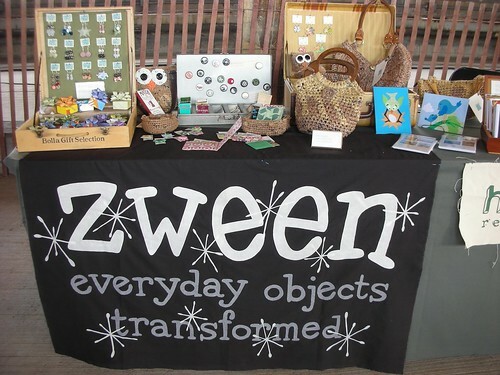 Can I ask how big the letters of “Zween” is on your banner – I like that it’s real bold. I’m planning to create a banner and I’m trying to figure out proper letter size. I have more letters in my name than you do, so I can’t go too big = “Little Me Crafts”. Thank you so much! The height of the “zween” letters are 9.5 inches. Remember that my banner is only about 4 feet long, so there is still one foot on each side when I use my 6 foot table and 2 feet on each side when an 8 foot table is provided. Also, someone suggested that my website should have been included on the banner and I would have to agree with that suggestion. I hope yours turns out great! Wow, that’s huge. I just cut out my letters today and they are only 5″ – I hope it’s readable, mine will be about 3 1/2 feet long and I plan to hang mine somehow so it can be seen. I agree with putting your website on it, maybe you can stick it on the bottom in small print. Thanks for your input.